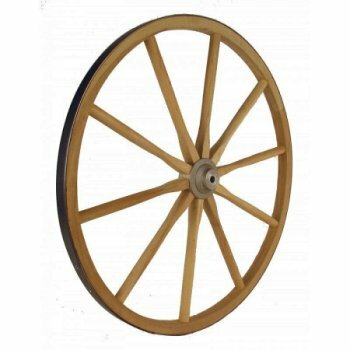 Lower Price, Top Quality Metal Split Hub Wood Wheel. 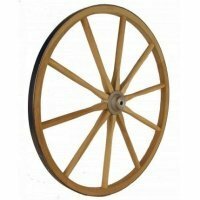 This wheel is one of our smallest steam bent wagon wheels and our least expensive. Small and inexpensive does not mean there is not quality in the construction of this wheel. The hub is solid cast aluminum which can be fitted with a brass bushing for extra durability. Like all of our wheels, it is made with solid steam-bent hardwood construction and hardwood spokes. All of our wheels have forge shrunk steel rims, this wheel rim is 1/8". Axles and Custom Wheels: we can make custom wheels up to 14 feet for most any project, for axles and custom wheel prices please Contact Us .